Everyone who has visited Odessa will agree that she has a special charm. The paved streets, the ancient courtyards and many architectural monuments – all this is a Pearl’s calling card from the sea. The plan of Odessa in 1794 provided geometrically correct, regular building of streets. The architects known at the time known as Franz Frapolli, Alexander Bernardazzi, Franz Boffo and many others built an uncomplicated city. The contribution of architect Boffo to the construction of Odessa. Franz Karlovich lived and worked in Odessa for 40 years. During this time he designed and built many buildings in the central part of the city, which soon became his business cards. Strolling along Primorsky Boulevard, you can enjoy its creations. This is the building of the City Hall, the Palace of Seamen and the House of Potocki, as well as the famous Potemkin Staircase. Did you know that the staircase at various times had names: Giant, Bulvarna, Urban and Rishelyevskaya? To date, more than 30 buildings have been preserved, built by architects, and most of them without significant changes in appearance. Our hotel is directly connected with the activities of the architect. Indeed, it is FK Boffo designed a shopping mall building in which Bortoli Hotel is located. An interesting monument of architecture is the Odessa Archives on Zhukovsky Street, 18. 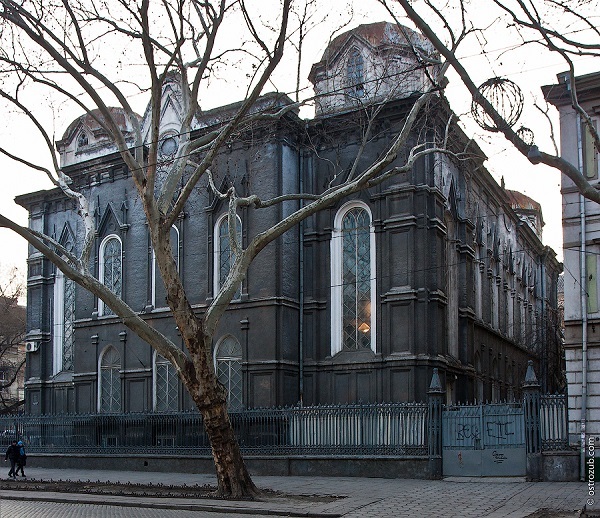 It was once the building of the Brodsky Synagogue (under the name of the city of Brody in Galicia), where the services were conducted in conjunction with the organ. But after the Second World War, the building handed over the archive. You can easily admire the old façade and even visit it, it’s free. To study the old documents you need a desire and a passport: the visitor is recorded in the reading room, he fills in the questionnaire and receives a work permit. And though it seems gloomy, it’s an excellent example of an ancient Gothic architecture with its arched windows. At the corner of Preobrazhenskaya and Deribasovskaya streets, the building of the shopping complex “Passage” and the hotel with the same name are tall. Previously, on the site of this institution were residential houses that were subsequently demolished, and the new building was built in just 2 years. 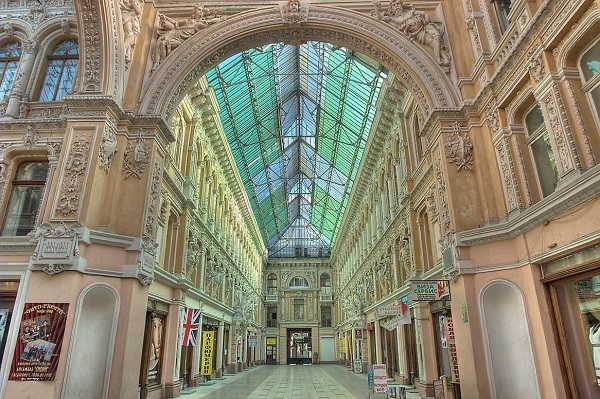 Already in 1900 a shopping center “Passage in Odessa” was opened. According to the scale of the design and the number of sculptures, he has no equal in Odessa. He is competing in decorative even with the Opera House. Entering the trade pavilion, lift your head and examine the smallest details of the stucco and the glass ceiling. For more than a hundred years the building has ceased to amaze guests of the city with its luxury. In 1824, the foundations of the Lutheran Church of St. Paul or Kirkha were laid. She stood safely until the end of the nineteenth century, later decided that Kirkha was slightly depleted and required repairs. 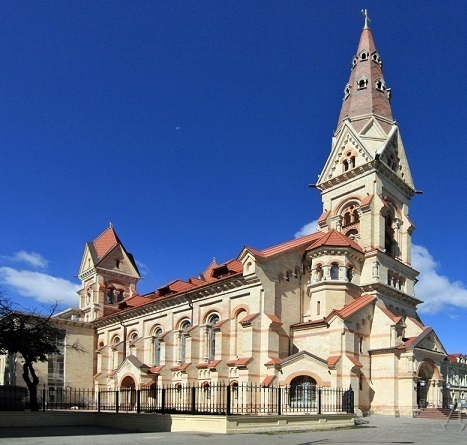 The old building was dismantled, and very soon a new Gothic style appeared on the same place. The church was well preserved until the fire in 1976. A great contribution to the restoration of the temple was made by the community in Bavaria and in 2010 the restoration was completed. The facade was made in the spirit of the Middle Ages, and the interior became modern. The Church of St. Paul is located in the city center on Novoselsky Street, 68. 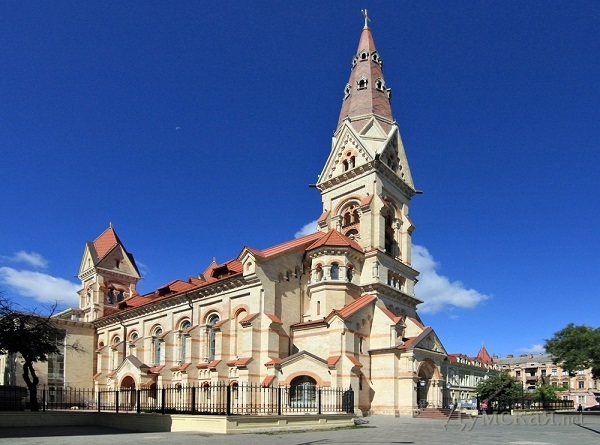 There is also an organ that was brought to Odessa from Germany. And everyone can come to listen to his sound. Under no circumstances do not forget to pay attention to the wonderful evening lighting of Kirkha.